Mickey Stones wants his Horncastle Town side to do a ‘professional job’ and book their place in the county cup final. The Wongers travel to the Fulstow Playing Fields to face Tetney Rovers on Saturday, full of confidence on the back of their six-game unbeaten run. And Stones is keen for that sequence to continue. “When you’re on a run you don’t want to get off it,” said the manager, who cited United Counties League Premier Division side Pinchbeck United as an example of the importance of breeding confidence within a squad. “Momentum is so important and when you’re on a good run you will give that extra five per cent to keep it going. “We used Pinchbeck as an example with the lads. They did really well to go on an unbeaten run of 36 games, but when they came off it they found it difficult to get back on it for a bit. While Town are desperate to lift the Mason Bros Lincs Junior Cup - one of their pre-season targets - Tetney will be no slouches. The East Lincs Combination side began the season in terrific form, registering 14 wins, two walkovers and a draw. But they suffered their first defeat of the campaign on Saturday, beaten 2-1 at home by AFC Holton Le Clay in the Football Stuff Village Trophy. 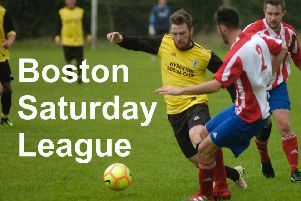 “Tetney were on an unbeaten run of their own, but they lost on Saturday,” Stones added. “Hopefully, that swings momentum our way a little bit. “We’re really up for it. It’ll be difficult but we’ve got to go for it. Kick off will be at 1.30pm.